ST Pharm said Monday that it has presented the pre-clinical trial results for STP0404, a drug candidate for the treatment of human immunodeficiency virus (HIV) infection, at the Keystone Symposia held in Vancouver, Canada. Ahn Seo-hyun, head of ST Pharm's new drug development division, presents the preclinical trials for STP0404 at the Keystone Symposia held in Vancouver, Canada, Friday. STP03-0404 is an allosteric integrase inhibitor that acts on a non-catalytic site. The company expects the treatment will become a first-in-class drug candidate that can overcome the resistance limitations of existing therapies. At the preclinical stage, STP0404 showed excellent inhibitory effects on various HIV-infected cell lines, including PBMC, MT-4 and CEMx174 while indicating no cytotoxic effects. In particular, the company confirmed the inhibitory effect against HIV-1 strain resistant to Raltegravir, a representative integrase catalytically active site inhibitor, which has raised the possibility of treating Raltegravir-resistant patients. ST Pham also confirmed the safety of the drug in repeated oral toxicity studies conducted in rodents and non-rodents. 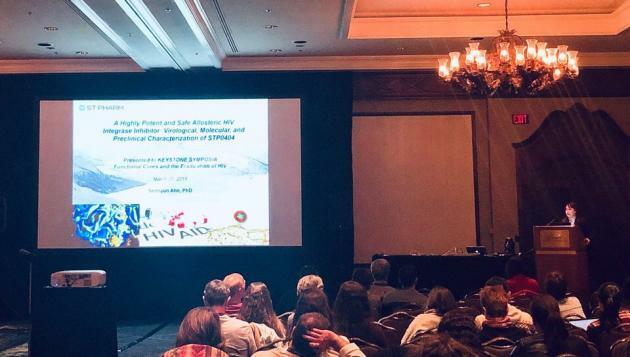 The company also presented the early work of a new mechanism to treat AIDS by eliminating the ability of viral RNA of HIV in host cells along with its preclinical trial results. ST Pharm has been working with the University of Emory to establish the mechanism of action of STP0404 after the U.S. National Institutes of Health (NIH) selected the company’s treatment as part of the institute’s life science research project.